This is a 2 week project. Show part of a comic book, like Superman. Talk about the speech bubbles. Introduce art of Lichtenstein and the other POP Art movement artists by reading the book, “1, 2, 3 POP” to the class and discussing the art works. Show art of Lichtenstein. Discuss the colors, shapes, and lines that students see. Introduce term, benday patterns, to the class. Look for examples in art prints. Demonstrate how to make the easels and the mat board art. Brainstorm POP words (onomatopoeias and interjections). Students may use their name or one of the POP words. 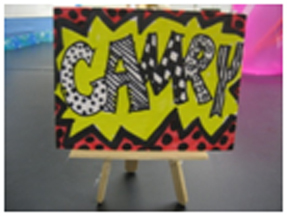 Use markers and Sharpies to do this art in the style of Lichtenstein. While students are working, choose a few to come use the hot glue gun to make easels. Be sure to put name on easels and mat boards. Place mini art on the easel and display art in office area, library, cafeteria, and counselor’s office, principal’s office, etc. This was a fun and sweet lesson. The kids really enjoyed it.